Stir fried mantou is a tasty way to use up stale mantou. An all in one meal/snack super quick and easy to prepare. A good way to use up anything in your fridge. 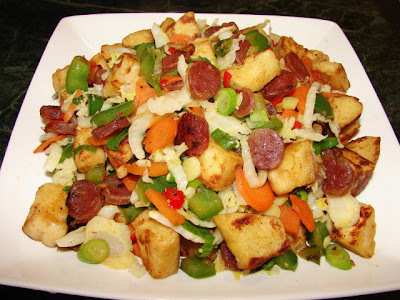 Use any vegetables you have and some meat like leftover cooked meat, bacon, ham, lap cheong, spam etc... add the usual garlic, spring onion, chilli etc.. for more flavour. I love to coat the mantou with beaten eggs. Cut 3 stale plain mantou into small pieces. Beat 1 large egg in a deep bowl. Cut a mixture of vegetables. I am using Chinese leaf (napa cabbage), carrot and green pepper. Cut 2 lap cheong into thin slices. (or cut other meat into small pieces) For vegetarian version, leave meat. Chopped a little garlic, chilli and some spring onion. Just before cooking, add mantou pieces to the beaten egg, stir to coat mantou with egg. Heat some oil add egg coated mantou, fry till pieces are golden brown. Remove. Heat a bit more oil stir in garlic. Stir till fragrant. Add in meat and vegetables. The tougher to cook ones in first till everything is cooked and tender. Add in some chopped chilli if using. Sprinkle with some spring onion. What a fantastic way to use up the leftover bread! Bread is ok if it is quite dense. What a refreshing idea! Thanks. this is so interesting! Recently, I've been crazy about mantou so I've made around 5 batches in the span of 2 weeks. I freeze the ones that I don't finish and it stays fresh like that. I never knew such a thing as this type of dish existed! It reminds me of french toast and croutons. It sounds so delicious. I might just try it one day. :) Thanks for sharing.